I was gifted an expensive Coach bag; unfortunately, the clasp broke. 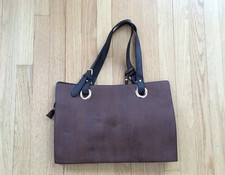 I would like to get it repaired, but I have no clue how to go about finding a company that specializes in handbag repair. I wonder if anyone in the AOA community can help me out? We get questions about repairing stuff like shoes or small household appliances and so often the answer ends up being: Yeah, unfortunately, people just don't repair stuff like that much anymore. But we're guessing there are still a few places that do this sort of work. So, got a suggestion for Donna? Please share. If it is in the same year of purchase you can send back to Coach for repair or replacement...Just FYI. Actually Coach will repair any of their products regardless of when purchased. I had a 6 year old leather overnight bag with a broken zipper and handle with broken metal clasp. On their website they give instructions for sending it for repair. I remember it only cost $20 for each repair. The bag came back better than new. The Russian guy in the shoe repair shop on New Scotland (intersection of Academy Rd) can fix anything. He's repaired everything from the zipper on one of my tents, to my brief bag to my wife's winter boots. As he says "I can fix!" I've had Enesto fix zippers on purses and hem pants so he can probably do that as well! He's at Ernesto Custom Tailoring - 1018 Central Ave in Albany.